The Sukhoi Su-34 (NATO reporting name: Fullback) is a Russian twin-engine, twin-seat strike fighter manufactured by Sukhoi Company. 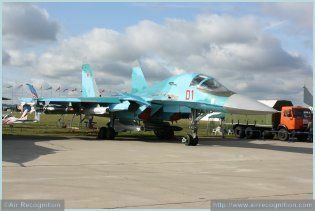 The Su-34 is based on the Su-27 Flanker and is intended to replace the Sukhoi Su-24. 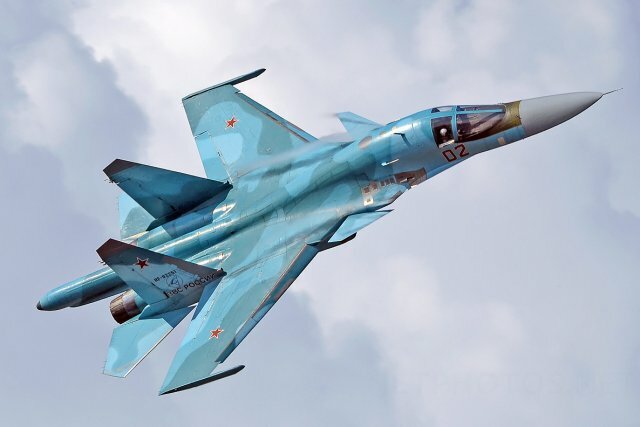 The Su-34 multirole aircraft combines the properties of an air superiority fighter, an air-defense suppression aircraft, and a strike aircraft. It can equally defeat diverse aerial, ground, and sea targets. All stages of its flight, including low-altitude nap-of-the-earth flying, as well as solo and group combat employment against aerial and ground targets are automated. 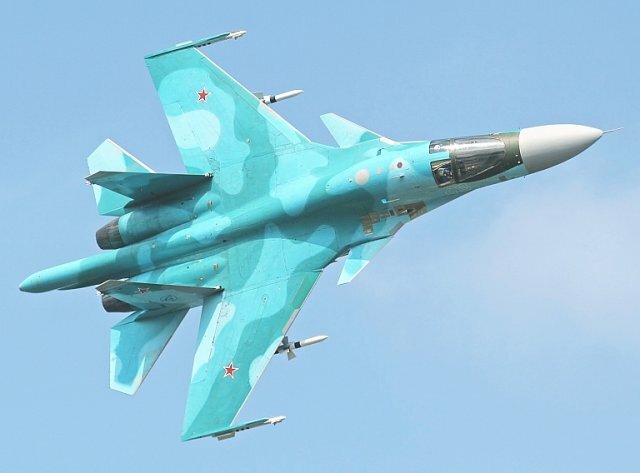 The Su-34 weapons complement enables its crew to deliver a preventive attack against any aerial targets, including the stealthy ones, effectively fight against air superiority fighters. electronic warfare and airborne early warning aircraft, and flying command posts to neutralize air-defense weapon control systems when performing en-route flight to a target, and to deliver standoff attacks against ground and waterborne targets. The Su-34 is developed from the Su-27 air superiority fighter with due account for the combat use of the Su-24 front-line bomber and its modifications, the Su-25 close-support aircraft and its modified versions, as well as advanced weapons and the most up-to-date technologies The crew of two ensures effective control of tactical aircraft group actions and efficient workload distribution during simultaneous control of the aircraft and weapons, fully Implementing the wide capabilities of up-to-date avionics systems. 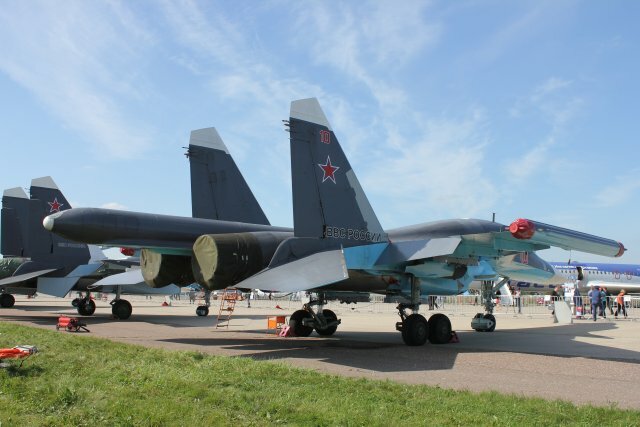 A total of 70 aircraft were to be purchased by 2015 to replace some 300 Russian Su-24s, which were at the time going through a modernization program. 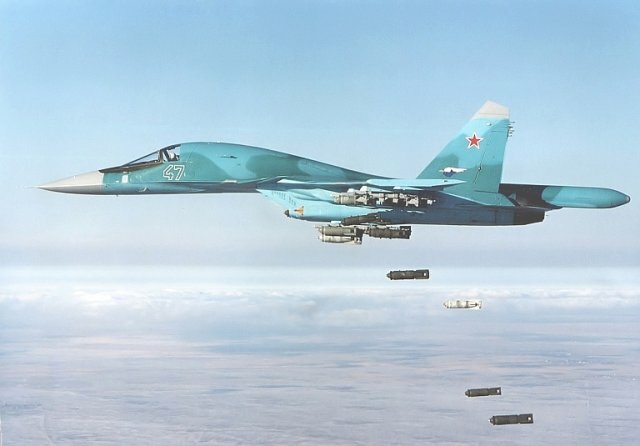 Former Russia's Minister of Defence Sergei Ivanov claimed that because the aircraft is "many times more effective on all critical parameters", the Russian Air Force will need far fewer of these newer bombers than the old Su-24 it replaces. 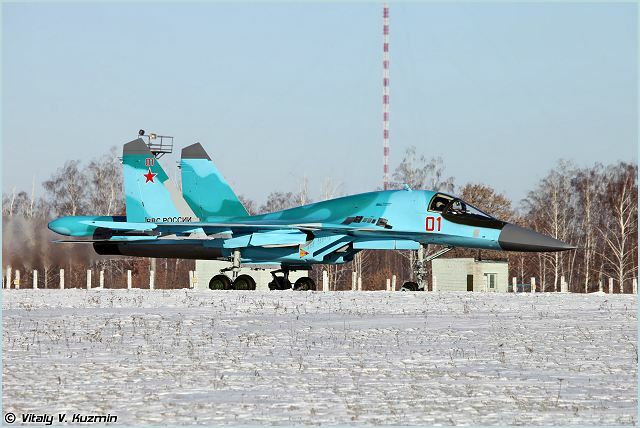 In December 2006, Ivanov revealed that approximately 200 Su-34s were expected to be in service by 2020. The final stage of the state tests were completed on 19 September 2011. Eighteen aircraft were delivered in 2014, and 20 planned to be delivered in 2015. 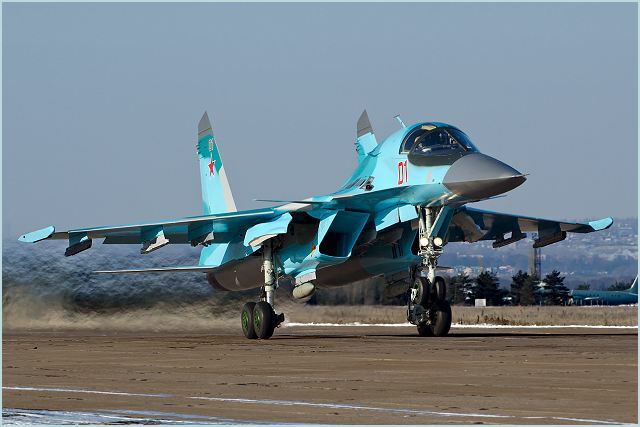 In 2014, 34 Su-34 Fullback were in use in the Russian Air Force. 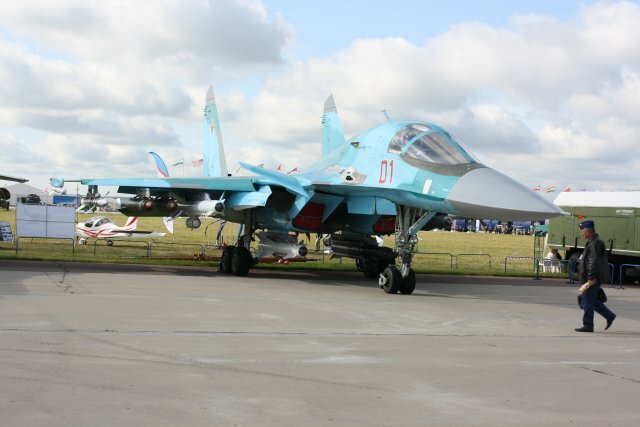 The aircraft shares most of its wing structure, tail, and engine nacelles with the Su-27/Su-30, with canards like the Su-30MKI/Su-33/Su-27M/35 to increase static instability (higher manoeuvrability) and to reduce trim drag. The aircraft has an entirely new nose and forward fuselage with a cockpit providing seating for a crew of two. The Su-34 features a side-by-side arrangement of the crew, which enabled developers to avoid redundancy of some instruments and controls, ensured excellent forward and downward out-of-cockpit view and maintained admissible ergonomic and sanitation standards. The cockpit entrance is provided at the cockpit rear wall through the nose wheel bay and a built-in step ladder mounted on the nose LG strut. The plot and the navigator-operator are accommodated in the K-36DM ejection seats featuring improved ergonomics. For the first time in the world practice for aircraft of this class, the cockpit is made as an armored all-welded titanium capsule. The emergency escape system enables the crew to abandon the aircraft throughout the entire flight altitude and speed envelope, as well as during taxiing or staying in the parking area. The Su-34's crew ejection system operates almost three times quicker than that of the Su-24M aircraft. 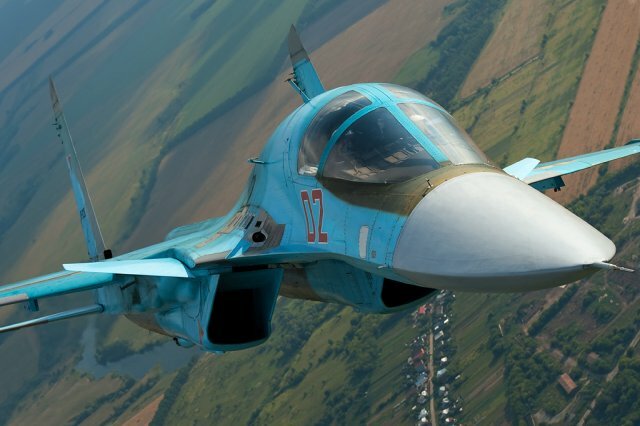 In terms of aerodynamic configuration, the Su-34 is an integrated unstable triplane with a thoroughly selected geometry of the wingroot extensions and parameters of a controllable all-moving canard. 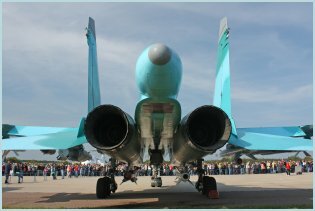 The first production aircraft of the Su-34 Fullback are powered by two NPO Saturn AL-31F turbofan engines, each rated at approximately 30,000lbs of thrust and are afterburner-capable for short bursts of increased speed. 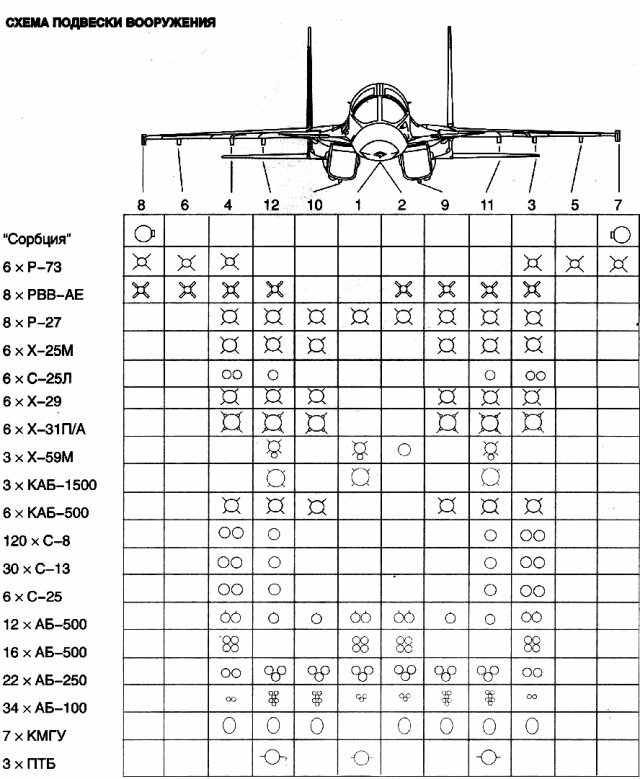 Later aircraft may be fitted with MMPP Salyut AL-31F-M2/3 or NPO Saturn 117 engines. They are mounted under the wing and are equipped with all-duty fixed geometry air intakes. A rotor protection installed in the air intakes provides protection against the ingestion of foreign objects. The twin engine arrangement allows for a maximum speed of Mach 1.8. Ferry range is out to 4,000 km and the aircraft's listed service ceiling is rouhgly 15,000 m.
The aircraft can carry 12,100kg of fuel internally in two fuel tanks in the wings and four in the fuselage. Three external fuel tanks, each with a capacity of 3,000l, can also be fitted. The aircraft has an aerial refuelling probe, plumbing for three drop tanks, and can carry the Sakhalin UPAZ-1A aerial refuelling pod performing as a buddy tanker. It can be refueled from the 11-78 (II-78M) flying tanker or other aircraft equipped with unified fuel dispensing units. - an optronic fire control and navigation complex incorporating a data display system, a plotter, and the Platan laser/TV station (other versions may be installed at the customers request). The multifunctional control consoles are the core of the avionics control system. The primary aircraft sensor is the large Leninets B-004 multimode phased array radar, which uses like all current Russian designs passive phase shifter technology with a Travelling Wave Tube (TWT) transmitter. The radar is claimed to be highly modular with redundant components, reflecting the APQ-164 model to achieve very high mission reliability on long endurance sorties. The X-band design is claimed to achieve a 15 kW peak power rating, although production radars could see the use of higher rating TWT transmitters since developed for the NIIP BARS series. The powerful multimode enhanced-definition phased-array radar enables it to detect small-size ground targets and simultaneously track several aerial target in a track-while-scan mode. The radar features a ground-mapping mode and ensures nap-of-earth flying. The weapon control system ensures automatic missile launch with preset intervals and in assigned sequence. 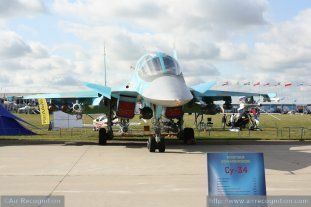 The Su- 34 is equipped with an inertial navigation system supplemented by a GNSS receiver (Glonass and likely GPS C/A) incorporating a laser gyro-based inertial navigation system combined with a satellite navigation system receiver, and radio navigation facilities. The automatic flight control system makes it possible to perform a planned-route flight and return to a preprogrammed airfield in the manual, automatic or director flight modes, including a prelanding maneuver, landing approach down to an altitude of 50 m and repeated approach for landing. 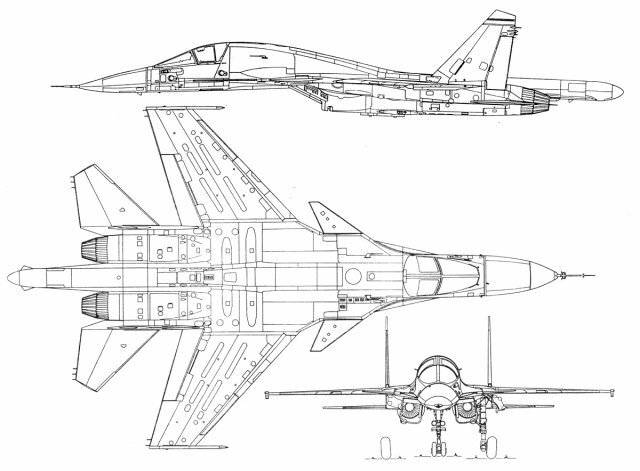 Defensive systems include a Radar Warning Receiver, most likely the current variant of the SPO-32 / L150 Pastel digital receiver carried by the Su-27/30. The podded wingtip mounted KNIRTI SPS-171 / L005S Sorbtsiya-S H/I band defensive jammer has been reported, this system being an evolution of a jammer developed for the Backfire C. The Sorbtsiya-S, unlike most Western jamming pods, is designed to operate in pairs and uses forward and aft looking steerable wideband phased arrays to maximise jamming effect. It is worth observing that the Sorbtsiya is clearly built to provide cross-eye jamming modes against monopulse threats, and the wideband mainlobe steering capability provided by the phased array permits best possible utilisation of available jamming power. 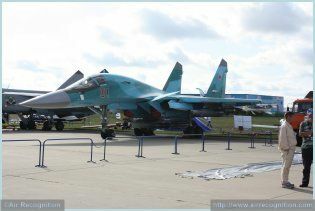 As a strike bomber aircraft, the Su-34 is able to carry a comprehensive range of weapons in addition to the 30 mm GSh-30-1 (9A-4071K) cannon (150–180 rounds). 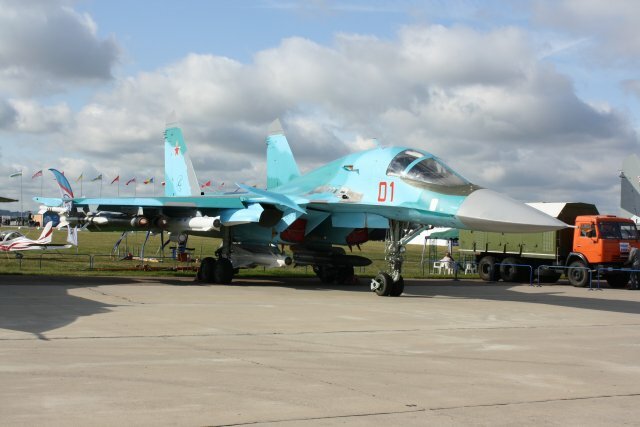 The Su-34's external weapons are suspended from 12 hardpoints and consist of a wide array of the following air-to-surface guided weapons provided with laser, radar (active and passive homing), TV and IR guidance systems to defeat ground targets: up to six Kh-31A(P), up to two Kh-59ME, up to six Kh-29L(TE), and up to six S-25LD missiles, as well as up to six KAB-500Kr and up to three KAB-1500L(Kr) guided aerial bombs. To fight against aerial targets while breaking through to a ground target, the fighter-bomber is equipped with air-to-air missiles. Application of the R-27 missiles provided with various guidance systems enhances jamming immunity and efficiency of its armament system. The RVV-AE medium-range active-homing missile carried by the aircraft is a universal weapon for engaging all types of flying vehicles. The RVV-AE long-range air-to-air missile, also known as the RR-77 or by the Nato designation AA-12, is manufactured by Vympel. The missile can intercept targets at speeds up to 3,600km/h and altitudes from 0.02km to 25km. The minimum range in the aft hemisphere is 300m and the maximum vertical separation between the host aircraft and the target is 10km. The R-73E short-range lR-homing missile can defeat a target far aside from the flight trajectory. The R-73 (Nato codename AA-11 Archer) short-range air-to-air missile is supplied by the Vympel State Engineering design Bureau in Moscow. The R-73 is an all-aspect missile capable of engaging targets in tail-chase or head-on mode. The missile has cooled infrared homing. The R-73 attacks the target within target designation angles of ±45° and with angular rates up to 60° a second. The missile can intercept targets at altitudes between 0.02km and 20km, target g-load to 12g, and with target speeds to 2,500km/h. 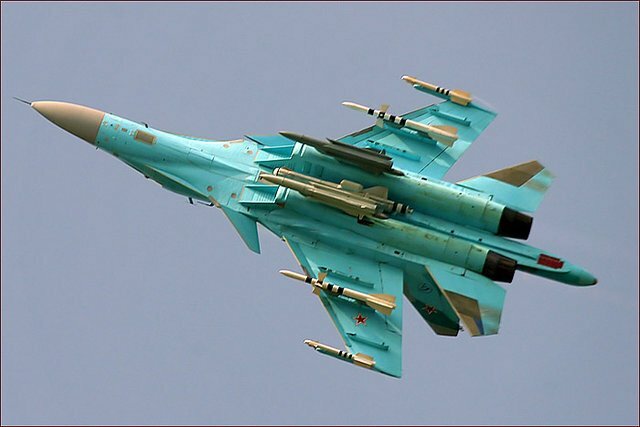 The Su-34 can carry up to six R-27R1 (ER1), up to six RVV-AE, or up to six R-73E missiles. For executing air combat missions, its standard weapon option includes six R-27T1 (ET1) air-to-air missiles. The aircraft is capable of carrying a supersonic heavy missile, designated 3M-80EA, with a launch range of up to 250 km. The missile is capable of defeating the largest surface ships, including aircraft carriers.